You are currently browsing the archives for the ESC Radio Awards category. Last weekend, the United Kingdom’s 2013 Eurovision representative Bonnie Tyler performed a concert in Potsdam, Germany. We met the Welsh singer and double award winner to hand over the trophies. The voting for this year’s ESC Radio Awards was held during the week ending June 16, and as usual votes came in not only from the countries that participated in the contest, but from our worldwide listenership including the Americas and Australia. Believe In Me, written by Desmond Child, Lauren Christy and Christopher Braide, won the Best Song voting with 12.6% of the vote, and Bonnie Tyler also topped the vote for Best Female Artist (16.9%). It’s the first time for a UK representative to pick up an award in the ESC Radio polls. The UK’s best result to date was a sixth place for Blue and I Can in 2011. Once again we have one winner who picks up the trophy in two categories: Bonnie Tyler, the Welsh singer who represented the United Kingdom in Malmö with the song Believe In Me, written by Desmond Child, Lauren Christy and Christopher Braide, wins the awards for Best Song and Best Female Artist with 12.6% and 16.8% of the vote, respectively. 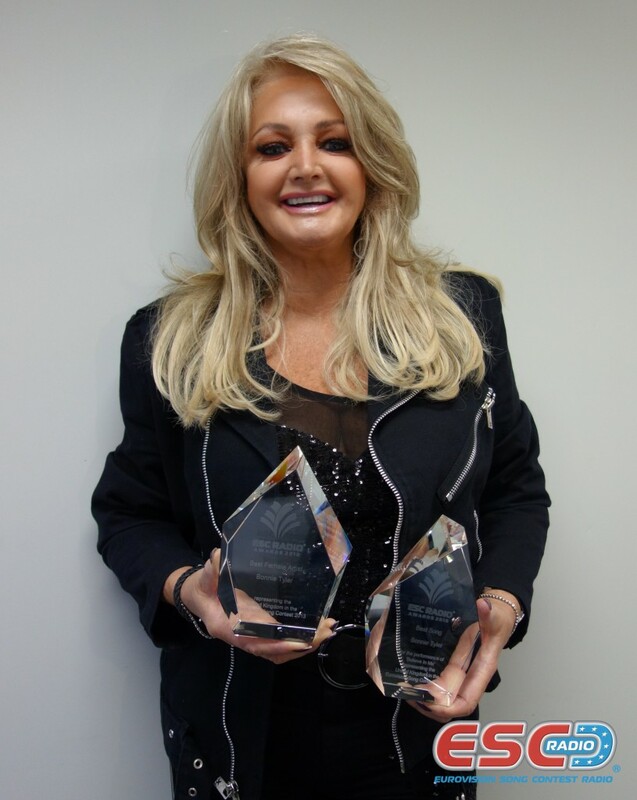 Congratulations, Bonnie Tyler! Marco Mengoni, Italy’s representative at this year’s ESC with the song L’Essenziale, came out the winner as Best Male Artist 2013. In the Best Group category it’s a clear win for Koza Mostra feat. Agathonas Iakovidis who represented Greece in Malmö (Alcohol Is Free). The international radio listeners have cast their votes, and they confirm Loreen’s spectacular Eurovision win last month in Baku, Azerbaijan, with the song Euphoria. With Loreen’s victory in two categories, ‘Best Song’ and ‘Best Female Artist’, Sweden triumphs for a second year in a row after winning two ESC Radio Award trophies last year with Eric Saade and Popular. Ott Lepland, who represented Estonia at this year’s ESC with the song Kuula, wins the trophy as ‘Best Male Artist 2012’. In the ‘Best Group’ category it was a veritable neck-and-neck race all the way, and only last night during the last hours of voting the decision fell in favour of Iceland’s duo Gréta Salóme & Jónsi who performed Never Forget in Baku. ESC Radio Awards 2011 – The Winners! Sweden’s 2011 Eurovision entry, “Popular”, written by Fredrik Kempe and performed by Eric Saade, won an impressive overall victory. While the song finished third in the contest in Düsseldorf, only 4 points behind Italy, “Popular” tops our awards poll for Best Song 2011 with a remarkable 31,3% of the vote. In addition, in the Best Male Artist category Eric scored a massive win with 49%, the highest percentage ever achieved in this category. So, our special congratulations go to Sweden, Eric Saade, and the composer of the song, Fredrik Kempe! In the Best Female Artist category, Germany’s Lena secured her win with 15,4% of the vote. At the contest in Düsseldorf, the 2010 Eurovision winner came 10th with the song “Taken By A Stranger”. In the category Best Group 2011, the trophies go to Jedward from Ireland. The ESC Radio listeners awarded them with 32,5% of the vote. Their song “Lipstick”, which has been doing quite well in the charts across Europe, ranks second place with the voters.